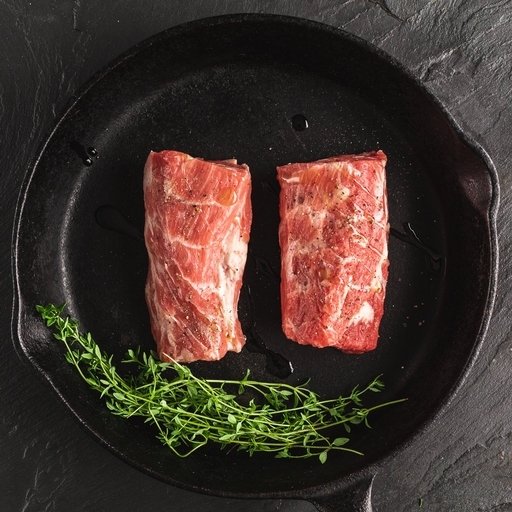 Organic lamb neck fillet. An inexpensive cut of meat with bags of flavour. It’s very versatile: combine with potatoes and root veg for a hearty winter stew or hotpot, or make chunky kebabs for a summer barbeque, with minted couscous and green salad. Try Kirsty's juicy, tender marinated lamb neck with yogurt, chilli and herbs recipe here. Can be cooked fast until pink in the middle, or slowly until tender - but nowhere in between. To quick cook, season well and sear it in a hot pan until nicely browned on all sides. Transfer to a moderate oven for about 8 mins, leaving to rest before slicing. To slow cook, brown the meat and transfer to the oven to cook at 160˚C/Gas 3 for 3 hours, preferably with some stock, wine, herbs and complementary veg, until completely tender. Lamb definitely benefits from the spring and early summer ‘bite’ of succulent, nutritious grass. Our RSPCA award-winning meat is from animals reared the traditional way and with welfare the number one priority. We only work with small scale farmers whose animals roam free range and are allowed to mature naturally. The result is tender meat with real depth of flavour. We cut and prepare all of our meat from the carcass at our own butchery.